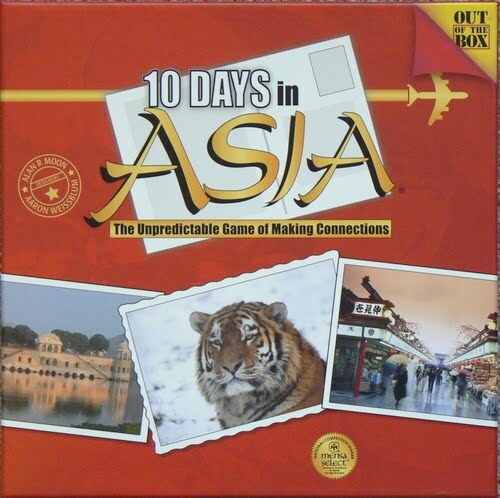 Death of Monopoly: A review of "10 days in Asia" and "10 days in Europe"
A review of "10 days in Asia" and "10 days in Europe"
As a child, I played many different board games, most being rather simplistic. I also remember quite well the games I played at others' homes. 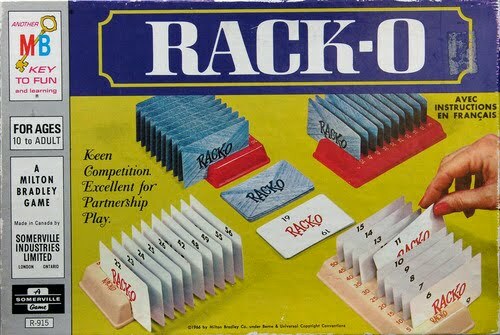 At one particular friend's place, there existed a well-known game from the 50's by the name of 'Rack-O'. Now the premise of Rack-O was pretty simple. There was a deck numbered 1-100 and you started with a hand of 10 cards placed one at a time in order on a rack. The game? Draw and discard a card each turn replacing a card on the rack, but preserving the order of the ten cards. Your goal? Get the ten cards in ascending sequence to win. Fun game - bit of a mix of math and rummy - but far too simple to remain interesting for long. The rules to the game are really quite simple. If you've played Rack-O (or even Rummy), then they should be easy to pick up. Anyone who has played any modern family games like Ticket To Ride will probably learn it in about 30 seconds. Having said that, I did play one game with someone who hasn't played any board games before. And she just couldn't seem to get it even after a couple rounds. So what do you do? Well, depending on the continent you are playing, the game consist of tiles with all of the different countries represented on the map board plus some helpful transportation tiles (boats and planes in Europe and boats, planes, and trains in Asia). 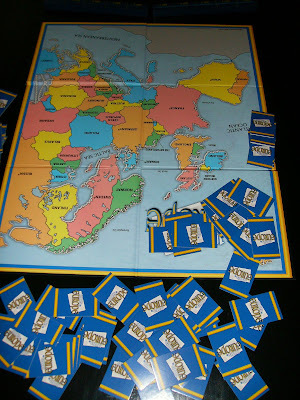 The players start by filling their racks with ten tiles, drawing them one at a time. A lot of strategy actually begins at this point. 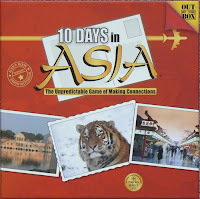 You are trying to construct a sequence from Day 1 to Day 10 that will resemble a trip through the different countries. 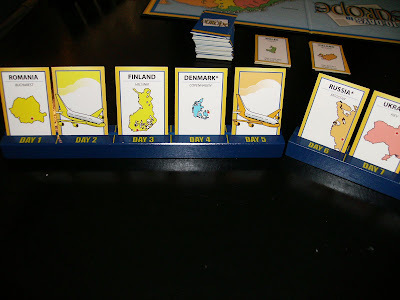 The goal is to have each day connected to the following either by placing adjacent countries next to each other in the sequence or by connecting two countries with a matching transportation tile (for example, a yellow plane between two yellow countries, or a body of water between two countries that are adjacent to that body of water). Although it possible to finish a complete legal 10-day trip during setup, I would say it's probably extraordinarily rare and I've never seen it. 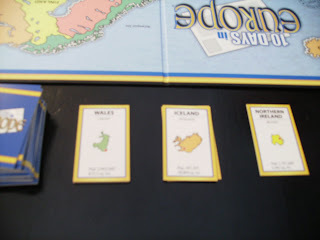 So in most cases, the real game then begins and players start to draw tiles and remove tiles one at a time to try and establish a complete journey. The real challenge is that you can't rearrange your tiles at all, just draw a tile, possibly replace a tile in that exact same spot, and discard. Helping this are three different discard piles which you can draw from in addition to the pile of randoms. Once you get a complete journey, you win the gamecimmediately. In general, a round takes about 20 minutes or less and in every round I've played, everyone wanted to play one more time. That's a good sign. And it's quite a lot of fun although people tend to get a bit serious and quiet during play. Most of the game consists of switching tiles, giddily stealing tiles discarded by other players, and anxiously awaiting that damned single "Moldovia" tile to come up so you can claim the win. Verdict: Tense but fun. Easy to pick up and very quick. In all games I play, I usually try to look for at least a hint of some mental exercise. And there is definitely some in both of these games. It in fact takes a lot of thought to try and plan out a valid route, especially with the placement at the beginning of a round. In mathematical terms, in Rack-O one tries to create a linear order between 1 and 100. With the 10 Days games, the order is only a partial order, not even, can have uncountable branches, and can start and end on any country. The choices are endless and decisions are tough which is what makes the game so fun. What will ruin the game for some is the absolutely overwhelming amount of luck also involved. Try as you might, you just may never draw the tiles you want. Or someone else will finish their route on their first turn of the round. Oh well. This doesn't bother me for two reasons: 1) the game is REALLY quick, and 2) I still feel like I'm getting a mental workout and learning something at the same time. I might suggest a scoring variant to fix this if the game is played over a number of rounds. I had thought of perhaps once someone claims the win, that each person scores a point for each day in their longest valid trip. The winner would get 10 plus maybe a few bonus points for going out. Over a few rounds, I think this would reward the best player. Thoughts? I have to respectfully disagree, Father Matt. As many exorcists hold, including Fr. Gabriele Amorth, the chief exorcist of Rome, the Harry Potter series tries to make a false distinction between "good" and "bad" magic, when in reality, it's all bad when it does not come from God. This has tended to get kids' curiosity going about black magic. Have you walked into a bookstore recently? Have a look at the children's section. It's 80% about warewolves and witches. It is now difficult to find books for my kids that don't deal with this stuff. Coincidence? Hardly. The author of the Harry Potter series is now a billionaire (that's a story in itself) and the books have spawned countless imitations. It's not all innocent as you claim. It is wrong (and I would add misleading) to state that Disney is the same thing. God bless your ministry. Well, this comment was definitely put on the wrong blog post! HA! I must respond to it, though, oddly enough as I adore the Harry Potter books. Um... magic doens't exist. Fantasy is fine. Most of us (including children over the age of 10) can grasp the difference between fact and fiction. The Harry Potter books are loaded with wonderfully moral messages and many Christian friends of mine (I'm a non-believer) can recognize them as the great literature that they are. Bwahahaha... obviously black magic at work! G.Ames, you've been the victim of a powerful curse. None of your comments will ever find their rightful bloggy home! I find it interesting that the name of the person blogging was "G. Ames" og "Games".... Weird!!! !